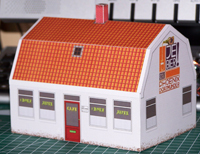 1/72 scale paper model of a Dutch village pub. A village wouldn't be complete without a pub, right? In this case it's the "Hoefijzer" or "Horse Shoe". The brand of beer advertised didn't survive the war by many years.